INTRODUCTION: Being exposed to violence at workplace is threatening to healthcare staff. Increasingly violence has been cited by nurses as the most important reason for leaving nursing profession. The current study aims to study the status of violence against medical staff of psychiatric hospitals affiliated to Isfahan University of Medical Sciences. METHODOLOGY: This study is a descriptive-applied research which studied 151 nurses working in Farabi and Khorshid hospitals in 2015. The tool for information gathering which was a standardized questionnaire on “workplace violence against medical staff” was filled in by the respondents. The study's questionnaire includes demographic information and two types of violence and abuse: physical and emotional (verbal aggression, bullying, racial, and ethnic). Chi-square test, t-test, and analysis of variance and logistic regression tests were used for statistical data analysis of answers. RESULTS: The results indicate that 58.9% of nurses have experienced physical violence while 81.4%, 32.4%, and 7.3% have been exposed to verbal violence, workplace bullying, and racial and ethnic violence, respectively. The most cases of violence have been perpetrated by patients and their families or companions. There was not a significant relation between likelihood of being exposed to different types of workplace violence and the hospital, level of physical contact with patient, and patient gender. CONCLUSION: Given the rate of reported violence in medical centers, the health authorities should make every effort to reduce healthcare-related abuse and violence through using of proper preventive strategies, proper management, taking safety measures, and increasing public awareness about all aspects of the issue. Violence is a behavior which can occur in different situations and different places. One of the most common types of violence is workplace violence which can affect organizations' employees. There is a comprehensive description on workplace violence, according to which, events which occur in workplace in which employees are threatened or exposed to physical abuse can be considered as workplace violence. There are four types of workplace violence including physical, emotional, sexual, racial and ethnic violence. Health workers are at higher risk of violence worldwide, and on average, about 50% of health workers suffer violence at some point in their careers. Violence has turned to an important reason for leaving nursing profession. An international survey on workplace violence against 1400 nurses in 17 countries across the world including the USA, Saudi, Afghanistan, and Taiwan indicated that 74% of nurses have witnessed workplace violence, 50% have suffered from workplace abuse, 26% have experienced physical abuse or have threatened with some types of weapon, and <10% of them have been stuck in the events. In Portugal, 100% of nurses, 88.9% of technicians, 88.2% of assistant nurses, and 85.7% of physicians have been exposed to some kind of violence at some point in their careers. Studies conducted in Iran also indicate that in Ilam Province, 80% of nurses have been exposed to verbal aggression while more than 10% have experienced physical abuse. In Tehran, 26% of nurses experienced at least one verbal abuse and bullying in the past year, and 33% did not experience any mental violence in the workplace. In Urmia, West Azerbaijan Province, 73.8% of nurses have experienced workplace violence committed by patients. Given the fact that nurses are struggling with different kinds of violence at their workplace and violence is prevalent in health centers, conduction of more studies can be effective for better identification of the problems to address them. So far, only a few studies have been conducted in this regard in Isfahan, while identification of the current status of hospitals is a necessity for the development of interventions to prevent violence against healthcare staff. The survey has studied the prevalence of all kinds of workplace violence against psychiatry wards health staff in Farabi, Noor, and Ali Asghar (all hospitals are affiliated to Isfahan University of Medical Sciences) Hospitals in Isfahan. Risk factors attributed to violence cases were also studied. The current study is a descriptive-applied research which studied psychiatry wards staff (271 individuals) in three hospitals of Ali Asghar, Noor, and Farabi, which are all affiliated to Isfahan University of Medical Sciences, in the year 2015. First, in a pilot sample of 36 individuals, violence rate was calculated as (P) 0.89, and based on Cochran's sample size formula, the study sample size (with 95% confidence level and margin of error of 0.05) was calculated as 151 individuals. The number of employees in the Khorshid Hospital 62 and in the Farabi Hospital, was 173, the sample was distributed between the two hospitals in accordance with the number of staff working in each hospital. A total of 49 healthcare staff from Khorshid Hospital and 102 employees from Farabi Hospital were chosen randomly (by using the list of employees in the year 2015). Then, we coordinated with the head of the hospital and the questionnaires were distributed. The tools for information collection include standardized questionnaires developed by International Labor Organization, World Health Organization, Transcultural Nursing Society, and International Association of Public Services. The tests were modified based on the social situation of the country. The questionnaire had 43 questions including questions about demographic information and some other question about verbal aggression, physical abuse, sexual harassment, and racial/ethnic harassment. The quantitative and qualitative questions were scored or coded. The validity of questionnaire was submitted by a number of experts in various fields of nursing, health, and social health care. The reliability of the questionnaire was also calculated through Cronbach's alpha test. The test result (0.83) indicates that the questionnaire has a coherent structure. The questionnaire was approved and granted an ethics code by Ethics Committee at Isfahan University of Medical Sciences. Collected data were analyzed through SPSS Version 19 (IBM Company USA), t-test, one-way analysis of variance, and regression logistic, and the significance level was set at <0.05. Out of 151 nurses working in the two hospitals, 99 were female (65.6%) and 52 were male (34.4%). The average age of the employees was 32.18 ± 5.68. The average period of the employees' working experience was 8.59 ± 5.72 and most of them were working in more than 1 shift in a 24 h period. A total of 145 nurses were in direct contact with patients (96%) of whom 82 nurses (56.6%) were providing services such as washing, lifting, and feeding to the patients. 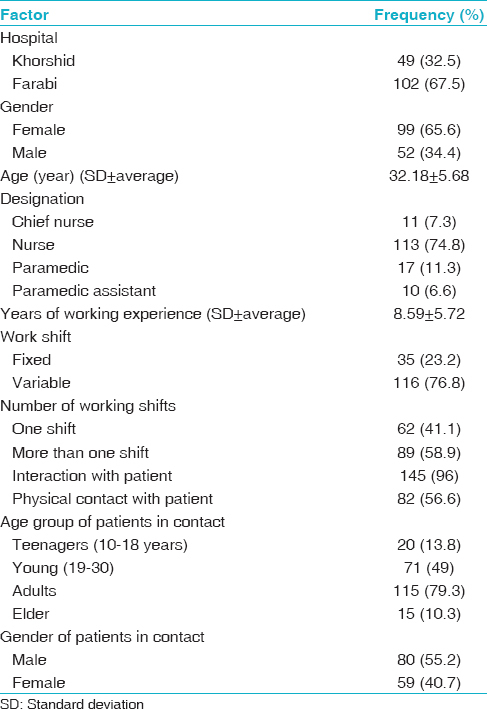 Most of the patients were adults (115 patients/79.3%) of whom eighty patients (55.2%) were in direct contact with male nurses while 59 patients (40.7%) were in direct contact with female nurses [Table 1]. Among the nurses, 89 (58.9%) of nurses with physical violence, 123 (81.4%) with mental violence, 49 (32.4%) with bullied and 11 (7.3%) had severe abusive discomfort. The most and the least common types of violence against nurses were verbal aggression and racial/ethics harassment, respectively. Based on the study's findings, at least one type of workplace violence has happened to 132 nurses (78%) while 19 nurses (12.6%) have never exposed to any type of violence at their workplace. The most number of violence have been perpetrated by patients while verbal aggression and physical aggression have been committed mostly by patients' family members. Racial/ethnic harassment and bullying were more committed by other staff in the health centers. Therefore, a significant statistical relation was found between the type of violence and the type of violator (P < 0.0.5) [Figure 1]. On the other hand, investigation of nursing staff response and reaction to violence based on the type of the violence indicated that in 42 cases of physical abuse, 47.2% nurses have tried to defend themselves. In 39 cases of bullying, 79.5% of nurses have reported the cases to their families or to the hospital managers. Furthermore, in four cases of racial harassments, 36.4% have not done anything to defend themselves. Therefore, a significant difference was found between type of the violence and nurses' reactions (P < 0.0.5). For example, in physical violence, reactions such as information to law enforcement agencies and claims of compensation have been observed, but these reactions have not been seen in the behavior of bullying and racial-ehnic [Table 2]. The reason for not filing a complaint against eighty cases of physical abuse (89.9%) was embarrassment while the reason was “not paying attention” in 28 cases of verbal aggression (22.8%). In bullying (63.7%) and racial harassment (54.5%), uselessness of filing a complaint was the main reason nurses cited for not filing a complaint against them. According to Chi-square test, there is a significant relation between not filing a complaint with types of violence (P < 0.0.5) [Table 3]. Finally, investigation of risk factors effective on violence outbreak showed that percentage of frequency of violence outbreak in Farabi Hospital, equal to 63.6%, was much higher compared to Khorshid hospital, with 36.4% of frequency. In other words, the impact factor (β) has been 2.33 effective on violence outbreak, which statistically is a significant difference (P < 0.05). Yet, factors such as gender, age, job level, years of working experience, and work shift of nurses have not been effective on violence outbreak against them (P > 0.05). 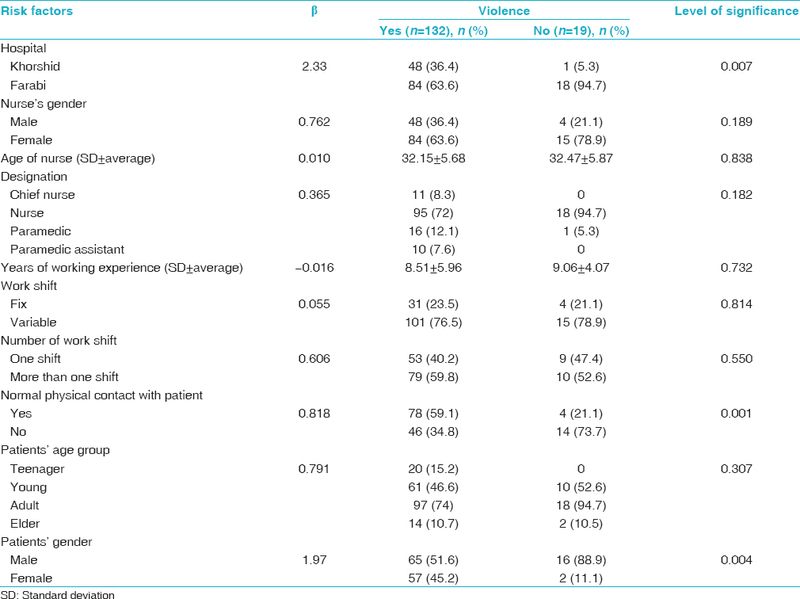 Also, physical contact with the patient such as washing, twisting, lifting the patient was very effective in the incidence of violence against the nurse with the impact factor of 1.81 (β) (P <0.05), meaning that the nurses have been subjected to violence during physical contact in 78 cases (59.1%) and only four cases (21.1%) remained indifferent. Therefore, physical contact is considered a stimulant of violence. On the other hand, the age of patients, interacting with nurses had no significant relation with violence outbreak (P > 0.05). However, gender had an impact factor of 1.97, showing significant relation with violence outbreak (P < 0.05). Female patients in 75 cases (45.2%) showed violence against nurses, while male patients showed violence in 65 cases (51.6%) [Table 4]. Based on the research findings, nurses were mostly subjected to psychological violence, most frequently reporting verbal violence. Bullying and physical violence were less frequently reported. However, in other similar researches, contrasting findings have shown verbal and physical violence as the most frequent types of violence posed to nurses.,,, For instance, in an earlier research, it was found that physical violence against nurses in the United States was 67%. In addition, in Thailand, verbal violence was 45.9% and physical violence was 4.6%. In Iran, based on the study carried out in Tehran by Ghodsbin et al., physical violence was found 9.1% and verbal violence was 72.7%. According to Zamanzadeh et al., verbal violence against nurses was the most frequent, and sexual violence, the least frequent type of violence. Physical violence has also been subjected by a research done in Azerbaijan Province, showing high frequency among other types of frequency. In a research by Shoqi, investigating violence against nurses working in 20 medical centers in Tehran, it was shown that 19.1% of individuals were subjected to physical violence at least once during the past 6 months. The figure was 19.7% in the research by Ergan, carried out in Turkey. Therefore, it seems that normally, physical violence happens simultaneously or following verbal violence. Furthermore, the present study shows that most violent actions have been perpetrated by patients and their companions to nurses. Yet, clinic staff and nurses have posed ethnic violence on the patients. Similarly, in a large number of studies, verbal and physical violence were perpetrated by patients and their companions, while most cases of ethnic and sexual violence were by clinic staff, physicians, and nurses.,, For example, Timurzada in his study was reported the most physical violence by the patients' companions and then by the patient. In Celik et al., violence was mostly posed by patients and their companions, suggesting that taking measures to limit the presence of companions in urgency rooms might decrease physical violence posed on the staff. In the present research, the nurses have most frequently responded to the physical violence through communicating with their colleagues. In case of bullying, they have shared the case with their family members. In addition, in ethnic-racial violence cases, the nurses have been mostly indifferent. The results are consistent with the findings of earlier researches.,,,,, Accordingly, it can be mentioned that because violence has caused injuries only in few cases, the nurses have accepted and considered violence as a natural part of their jobs. There might be cases in which nurses were reluctant to recite the issue because they know they would not receive an appropriate feedback or their utterance will be inaccurately shared among other staff. In addition, there would not be clear instructions regarding such cases. In addition, the patient's gender has had a significant relation with violence outbreak, yet this was not the case with the nurses' gender differences, although violence by female nurses was slightly higher than male nurses. Other studies have shown that in all hospital units, female nurses were mostly victim of violence,, which is in contrast with the present research. Higher proportion of female nurses might be the reason why they are most frequently subjected to violence. Nursing is mostly women's favorite job, and men are less willing to involve themselves in patients' issues. Finally, in the present research, age, job level, work shift, working experience, and age difference between nurses and patients had no significant relation with violence outbreak. 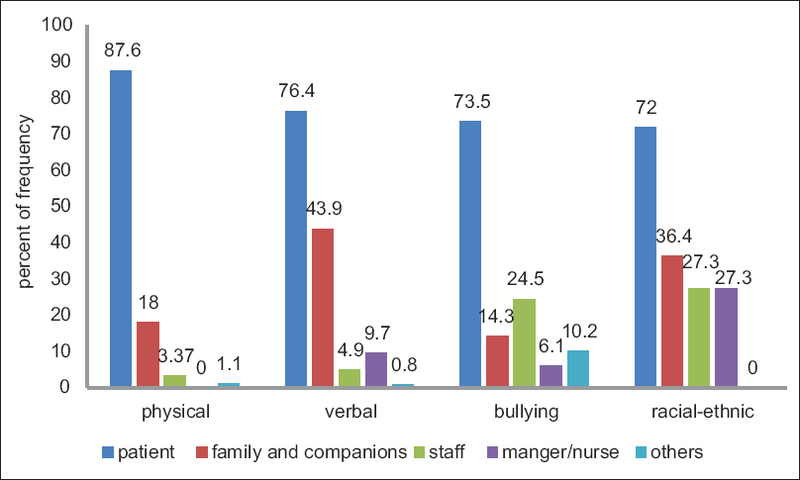 Based on the results, nurses working in psychiatric hospitals are exposed to different types of violence with various degrees in working place by patients and in some cases by their family members and companions. Such conditions create anxiety, insecurity, and work difficulty. Given the fact that nursing is a special-sensitive job requiring secure and friendly environment, the policy makers and managers should put priority on taking preventive actions in decision-making and setting grounds for working place health. Based on the high rate of violence posed to nurses, the present study suggests that creating peace, motivating the staff, optimization of working place, developing human resource, regulated and on-the-job training sessions on different practical techniques in defying violence are necessary to develop nurses' and physicians' physical and psychological health. Training interpersonal skills and violence control to freshmen and medical students, providing a secure working place, supporting the staff, timely and appropriate use of isolated rooms and equipment for aggressive patients, providing consult sessions for victimized nurses, hiring enough staff to prevent making grounds for violence, creating an integrated preventive and reporting process to be used after violence cases occur is recommended. This study was conducted with the support of Isfahan University of Medical Sciences. International Labour Office, Gender equality and social dialogue: An annotated bibliography. International Labour Organization, Geneva: ILO, 2012 ISBN 9789221265641; 9789221265658. World Health Organization. What is Workplace Violence. Available from: http://www.who.int/violence-injury-prevention/injury/work9/en/index2.html. [Last retrieved on 2008 Nov 18]. Saines JC. Violence and aggression in A&E: Recommendations for action. Accid Emerg Nurs 1999;7:8-12. Mechem CC, Dickinson ET, Shofer FS, Jaslow D. Injuries from assaults on paramedics and firefighters in an urban emergency medical services system. Prehosp Emerg Care 2002;6:396-401. Hader R. Workplace violence survey 2008. Unsettling findings: Employees safety isn't the norm in our healthcare settings. Nurs Manage 2008;39:13-9. Cezar ES, Marziale MH. Occupational violence problems in an emergency hospital in Londrina, Paraná, Brazil. Cad Saude Publica 2006;22:217-21. Lin YH, Liu HE. The impact of workplace violence on nurses in South Taiwan. Int J Nurs Stud 2005;42:773-8. O'Connell B, Young J, Brooks J, Hutchings J, Lofthouse J. Nurses' perceptions of the nature and frequency of aggression in general ward settings and high dependency areas. J Clin Nurs 2000;9:602-10. Winstanley S, Whittington R. Aggression towards health care staff in a UK general hospital: Variation among professions and departments. J Clin Nurs 2004;13:3-10. Mozafari M, Tavan H. Survey of violence against nursing in the Ilam training hospitals at 2012. J Ilam Univ Med Sci 2013;21:152-60. Teymoorzadeh E, Rashidian A, Arab M, Akbari Sari A, Ghasemi M. Exposure to psychological violence among the nursing staff in a large teaching hospital in Tehran. SJSPH 2009;7:41-9. Soheili A, Mohammadpour Y, Jafarizadeh H, Habibzadeh H, Mehryar H, Rahmani A. Violence against nurses in emergency departments of Urmia university hospitals in 2013. J Urmia Nurs Midwifery Fac 2014;12:874-82. Privitera M, Weisman R, Cerulli C, Tu X, Groman A. Violence toward mental health staff and safety in the work environment. Occup Med (Lond) 2005;55:480-6. Kamchuchat C, Chongsuvivatwong V, Oncheunjit S, Yip TW, Sangthong R. Workplace violence directed at nursing staff at a general hospital in Southern Thailand. J Occup Health 2008;50:201-7. Kennedy MP. Violence in emergency departments: Under-reported, unconstrained, and unconscionable. Med J Aust 2005;183:362-5. Gates DM, Gillespie GL, Succop P. Violence against nurses and its impact on stress and productivity. Nurs Econ 2011;29:59-66, quiz 67. Talas MS, Kocaöz S, Akgüç S. A survey of violence against staff working in the emergency department in Ankara, Turkey. Asian Nurs Res (Korean Soc Nurs Sci) 2011;5:197-203. Shoghi M, Sanjari M, Shirazi F, Heidari S, Salemi S, Mirzabeigi G, et al. Workplace violence and abuse against nurses in hospitals in Iran. Asian Nurs Res (Korean Soc Nurs Sci) 2008;2:184-93. Ghodsbin F, Dehbozorgi Z, Tayari N. Workplace violence against nurses. Shahed J Med Sci 2008;16:45-52. Zamanzadeh V, Soleimannejad N, Abdollahzadeh F. The workplace violence against nurses working in East Azarbaijan Province hospitals, Iran. J Res Nurs 2009;29:61-6. Senuzun Ergün F, Karadakovan A. Violence towards nursing staff in emergency departments in one Turkish city. Int Nurs Rev 2005;52:154-60. Henderson AD. Nurses and workplace violence: Nurses' experiences of verbal and physical abuse at work. Nurs Leadersh (Tor Ont) 2003;16:82-98. Jackson D, Clare J, Mannix J. Who would want to be a nurse? violence in the workplace – A factor in recruitment and retention. J Nurs Manag 2002;10:13-20. Tymorzadeh E, Rashidian A, Arab M, Akbari A, Gasemi M. Measuring nurses' psychological violence exposure in a large teaching hospital in Tehran. J Sch Public Health Inst Health Res 2009;7:41-9. Celik SS, Celik Y, Aǧirbaş I, Uǧurluoǧlu O. Verbal and physical abuse against nurses in Turkey. Int Nurs Rev 2007;54:359-66. Eichelman BS, Hartwig AC. Patient Violence and the Clinician. Clinical Publication: American Psychiatric Press; 1993. McKenna BG, Poole SJ, Smith NA, Coverdale JH, Gale CK. A survey of threats and violent behaviour by patients against registered nurses in their first year of practice. Int J Ment Health Nurs 2003;12:56-63. Evers W, Tomic W, Brouwers A. Aggressive behaviour and burnout among staff of homes for the elderly. Int J Ment Health Nurs 2002;11:2-9. Samir N, Mohamed R, Moustafa E, Abou Saif H. Nurses' attitudes and reactions to workplace violence in obstetrics and gynaecology departments in Cairo hospitals. East Mediterr Health J 2012;18:198-204. McCall BP, Horwitz IB. Workplace violence in Oregon: An analysis using workers' compensation claims from 1990-1997. J Occup Environ Med 2004;46:357-66. Estryn-Behar M, van der Heijden B, Camerino D, Fry C, Le Nezet O, Conway PM, et al. Violence risks in nursing – Results from the European 'NEXT' study. Occup Med (Lond) 2008;58:107-14.